American manned rocketplane. Flown 1952. The X-1A, B, and D were essentially identical rocketplanes intended to reach speeds above Mach 2. The X-1A and X-1D were destroyed in in-flight explosions; the X-1B survived, training future moon lander Neil Armstrong on its last flights in 1958. Family: Rocketplane, Suborbital, US Rocketplanes. Country: USA. Engines: XLR11. Propellants: Lox/Alcohol. Agency: Bell. Bibliography: 4297, 49, 97. 1954 August 29 - . X-1B Flight 1 - . Crew: McKay. Payload: X-1B flight 12. Nation: USA. Related Persons: McKay. Class: Manned. Type: Manned rocketplane. Spacecraft Bus: XS-1. Spacecraft: X-1B. NACA flight 2. Cabin-pressure regulator malfunction causes inner canopy to crack; only low-speed, low-altitude maneuvers made..
1954 September 24 - . X-1B Flight 2 - . Crew: Ridley. Payload: X-1B flight 1. Nation: USA. Related Persons: Ridley. Class: Manned. Type: Manned rocketplane. Spacecraft Bus: XS-1. Spacecraft: X-1B. AF flight 1. Glide flight, because of turbopump over-speeding..
1954 October 6 - . X-1B Flight 3 - . Crew: Ridley. Payload: X-1B flight 2. Nation: USA. Related Persons: Ridley. Class: Manned. Type: Manned rocketplane. Spacecraft Bus: XS-1. Spacecraft: X-1B. AF flight 2. Glide flight, aborted power flight because of evidence of high lox-tank pressure..
1954 October 8 - . X-1B Flight 4 - . Crew: Murray. Payload: X-1B flight 3. Nation: USA. Related Persons: Murray. Class: Manned. Type: Manned rocketplane. Spacecraft Bus: XS-1. Spacecraft: X-1B. AF flight 3. First powered flight..
1954 October 13 - . X-1B Flight 5 - . Crew: Stephens. Payload: X-1B flight 4. Nation: USA. Related Persons: Stephens. Class: Manned. Type: Manned rocketplane. Spacecraft Bus: XS-1. Spacecraft: X-1B. AF flight 4..
1954 October 19 - . X-1B Flight 6 - . Crew: Childs. Payload: X-1B flight 5. Nation: USA. Related Persons: Childs. Class: Manned. Type: Manned rocketplane. Spacecraft Bus: XS-1. Spacecraft: X-1B. AF flight 5..
1954 October 26 - . X-1B Flight 7 - . Crew: Hanes. Payload: X-1B flight 6. Nation: USA. Related Persons: Hanes. Class: Manned. Type: Manned rocketplane. Spacecraft Bus: XS-1. Spacecraft: X-1B. AF flight 6..
1954 November 4 - . X-1B Flight 8 - . Crew: Harer. Payload: X-1B flight 7. Nation: USA. Related Persons: Harer. Class: Manned. Type: Manned rocketplane. Spacecraft Bus: XS-1. Spacecraft: X-1B. AF flight 7..
1954 November 26 - . X-1B Flight 9 - . Crew: Holtoner. Payload: X-1B flight 8. Nation: USA. Related Persons: Holtoner. Class: Manned. Type: Manned rocketplane. Spacecraft Bus: XS-1. Spacecraft: X-1B. AF flight 8..
1954 November 30 - . X-1B Flight 10 - . Crew: Everest. Payload: X-1B flight 9. Nation: USA. Related Persons: Everest. Class: Manned. Type: Manned rocketplane. Spacecraft Bus: XS-1. Spacecraft: X-1B. AF flight 9..
1954 December 2 - . X-1B Flight 11 - . Crew: Everest. Payload: X-1B flight 10. Nation: USA. Related Persons: Everest. Class: Manned. Type: Manned rocketplane. Spacecraft Bus: XS-1. Spacecraft: X-1B. AF flight 10. Mach 2.3 at 19825 m..
1956 August 14 - . X-1B Flight 12 - . Crew: McKay. Payload: X-1B flight 11. Nation: USA. Related Persons: McKay. Class: Manned. Type: Manned rocketplane. Spacecraft Bus: XS-1. Spacecraft: X-1B. NACA flight 1. Pilot check; nose landing gear failed on landing, minor damage..
1956 September 7 - . X-1B Flight 13 - . Crew: McKay. Payload: X-1B flight 13. Nation: USA. Related Persons: McKay. Class: Manned. Type: Manned rocketplane. Spacecraft Bus: XS-1. Spacecraft: X-1B. NACA flight 3. Speed run to 17080 m and mach 1.8. Limited heating data gathered..
1956 September 18 - . X-1B Flight 14 - . Crew: McKay. Payload: X-1B flight 14. Nation: USA. Related Persons: McKay. Class: Manned. Type: Manned rocketplane. Spacecraft Bus: XS-1. Spacecraft: X-1B. NACA flight 4. Glide flight, due to erratic engine start..
1956 September 28 - . X-1B Flight 15 - . Crew: McKay. Payload: X-1B flight 15. Nation: USA. Related Persons: McKay. Class: Manned. Type: Manned rocketplane. Spacecraft Bus: XS-1. Spacecraft: X-1B. NACA flight 5. Three-chamber engine run to 18300 m to obtain heating data..
1957 January 3 - . X-1B Flight 16 - . Crew: McKay. Payload: X-1B flight 16. Nation: USA. Related Persons: McKay. Class: Manned. Type: Manned rocketplane. Spacecraft Bus: XS-1. Spacecraft: X-1B. NACA flight 6. Mach 1.94 aerodynamic heating investigation (end of heating program)..
1957 May 22 - . X-1B Flight 17 - . Crew: McKay. Payload: X-1B flight 17. Nation: USA. Related Persons: McKay. Class: Manned. Type: Manned rocketplane. Spacecraft Bus: XS-1. Spacecraft: X-1B. NACA flight 7. Control pulses at mach 1.45 at 18300 m. Flight for instrumentation check..
1957 June 7 - . X-1B Flight 18 - . Crew: McKay. Payload: X-1B flight 18. Nation: USA. Related Persons: McKay. Class: Manned. Type: Manned rocketplane. Spacecraft Bus: XS-1. Spacecraft: X-1B. NACA flight 8. Supersonic maneuvers to mach 1.5 at 18300 m to determine the dynamic and static stability and control characteristics..
1957 June 24 - . X-1B Flight 19 - . Crew: McKay. Payload: X-1B flight 19. Nation: USA. Related Persons: McKay. Class: Manned. Type: Manned rocketplane. Spacecraft Bus: XS-1. Spacecraft: X-1B. NACA flight 9. Supersonic maneuvers to mach 1.5 at 18300 m to determine the dynamic and static stability and control characteristics..
1957 July 11 - . X-1B Flight 20 - . Crew: McKay. Payload: X-1B flight 20. Nation: USA. Related Persons: McKay. Class: Manned. Type: Manned rocketplane. Spacecraft Bus: XS-1. Spacecraft: X-1B. NACA flight 10. Aborted after launch, indication of open landing-gear door. Propellants jettisoned, completed as a glide flight..
1957 July 19 - . X-1B Flight 21 - . Crew: McKay. Payload: X-1B flight 21. Nation: USA. Related Persons: McKay. Class: Manned. Type: Manned rocketplane. Spacecraft Bus: XS-1. Spacecraft: X-1B. NACA flight 11. Mach 1.65 at 18,300 m. Control pulses, sideslips, and 2 g wind-up turn..
1957 July 29 - . X-1B Flight 22 - . Crew: McKay. 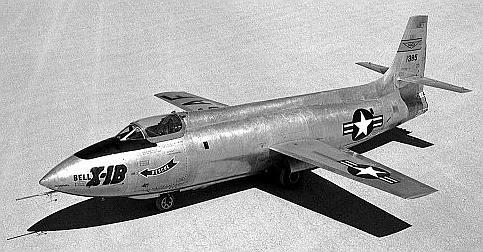 Payload: X-1B flight 22. Nation: USA. Related Persons: McKay. Class: Manned. Type: Manned rocketplane. Spacecraft Bus: XS-1. Spacecraft: X-1B. NACA flight 12. Enlarged wing tips installed to simulate wing tips to be used with reaction controls. Mach 1.55 at 18,300 m..
1957 August 8 - . X-1B Flight 23 - . Crew: McKay. Payload: X-1B flight 23. Nation: USA. Related Persons: McKay. Class: Manned. Type: Manned rocketplane. Spacecraft Bus: XS-1. Spacecraft: X-1B. NACA flight 13. Stability and control investigation. Mach 1.5 at 18300 m, accelerated maneuvers, control pulses, and pull-ups..
1957 August 15 - . X-1B Flight 24 - . Crew: Armstrong. Payload: X-1B flight 24. Nation: USA. Related Persons: Armstrong. Class: Manned. Type: Manned rocketplane. Spacecraft Bus: XS-1. Spacecraft: X-1B. NACA flight 14. Pilot check. Nose landing gear failed on landing, minor damage..
1957 November 27 - . X-1B Flight 25 - . Crew: Armstrong. Payload: X-1B flight 25. Nation: USA. Related Persons: Armstrong. Class: Manned. Type: Manned rocketplane. Spacecraft Bus: XS-1. Spacecraft: X-1B. NACA flight 15. First reaction-control flight..
1958 January 16 - . X-1B Flight 26 - . Crew: Armstrong. Payload: X-1B flight 26. Nation: USA. Related Persons: Armstrong. Class: Manned. Type: Manned rocketplane. Spacecraft Bus: XS-1. Spacecraft: X-1B. NACA flight 16. Low-altitude, low-mach reaction-control investigation..
1958 January 23 - . X-1B Flight 27 - . Crew: Armstrong. Payload: X-1B flight 27. Nation: USA. Related Persons: Armstrong. Class: Manned. Type: Manned rocketplane. Spacecraft Bus: XS-1. Spacecraft: X-1B. NACA flight 17. Reaction-control investigation. Mach 1.5 at 16775 m. Last NACA flight..